After living many years in Western Colorado, we are now in Northern California. 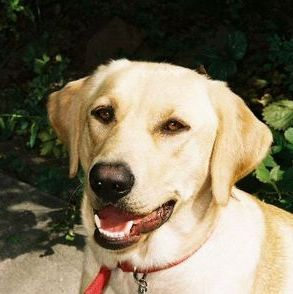 Thank you for visiting the website of Rocky Mountain Labradors of Northern California. Labs are amazing dogs and we feel they are quite possibly the best pet a family could have. We are proud to produce high quality, well socialized puppies that contribute to the beauty and intelligence of the Labrador Retriever breed. 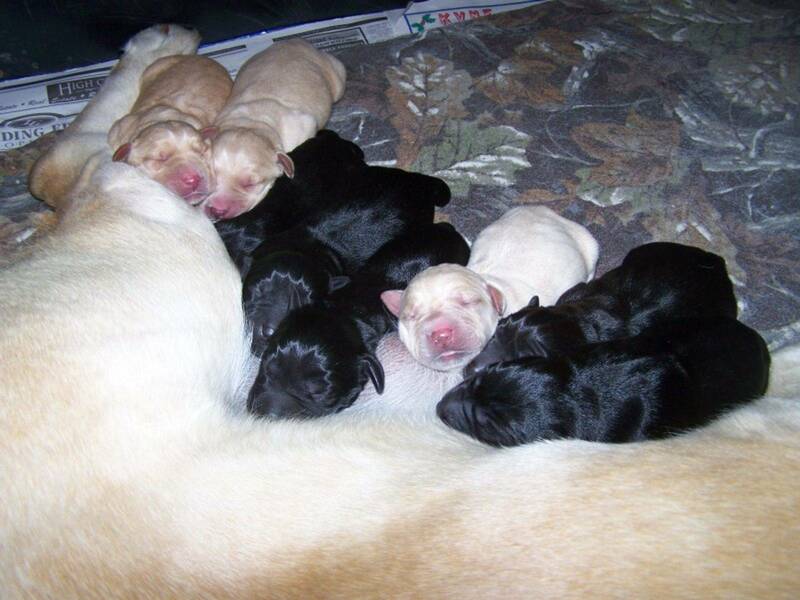 Our litters are from Champion Bloodlines and are AKC Registered with Full Registration. Our pups are socialized, water-trained, dewormed and receive their first vaccinations along with a complete veterinarian's exam. Pups are $1000 each and a $200 deposit is required to reserve your pup. Reservations are taken in the order in which deposits are received. For further information, please contact Deena Schmalz at happylabpups@gmail.com. For daily videos and photos, please visit our Instagram or Facebook pages (links listed below). We're happy to announce the arrival of our newest litter out of Omega of Sunny Mountain Sky and Duke's Mountain River Buster. 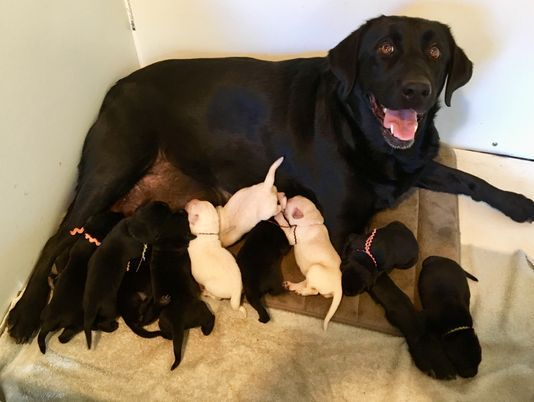 Ten healthy pups were born on Sunday, October 28, 2018. There are 3 males (1 yellow & 2 black) and 7 females (2 yellow & 5 black). We're still accepting deposits for this litter. These pups will be ready to join their new families during the second half of December 2018. For daily photos and videos of this litter, visit our Instagram or Facebook pages by clicking on the links above. Meg is the daughter of Sunny Mountain Sky & Walter P. She is 5 years old and weighs about 80 pounds. She was Sunny's last pup, thus the name Omega, which means "the end or the last". Meg is a happy pup and loves to be close to us. She has a laid-back personality and can frequently be found cuddling with her sister Tess when they sleep. Meg gets along well with everyone she meets, human or animal. 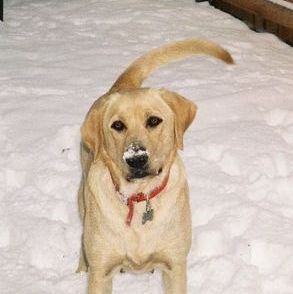 And like a typical Lab, she enjoys retrieving and swimming, but she especially loves rolling in the sand after a swim! Meg has a coal-black coat, even though her mother Sunny is yellow and her father Walter is chocolate. Her first litter in September 2013 was black and yellow, but we're hoping a chocolate puppy may still make an appearance. Meg is an excellent mother and was very relaxed during delivery. She even let her sister Tess help out later on with cleaning the pups. Meg's hips are certified free of hip dysplasia and are rated "GOOD" by the Orthopedic Foundation For Animals (OFA). Buster is the son of Duke's Rainy Mountain Tess and Tabeguache River Mountain. Buster, like his father River, has the classic Labrador build: lean muscular body and a strong neck with a beautiful, square head. Buster has a gorgeous shiny, black coat. He is 6 years old and weighs 80 pounds. Buster is lightning fast on both land and in water! He has an extremely strong retrieval instinct and absolutely loves being in the water. He is such a strong swimmer that he will pull you through the water if you grab on to his tail! Buster gets along very well with other animals, cats and dogs alike. He loves playing with children of all ages, especially if they will throw a ball for him. Tess is 10 years old and weighs about 75 pounds. She has a beautiful, light yellow coat with dark accents on her ears, but her chest and belly are almost white. 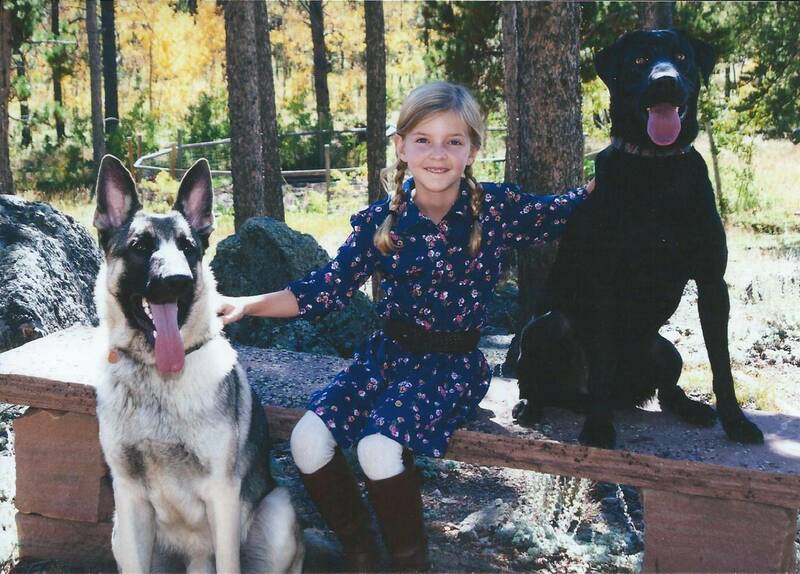 She is the daughter of Sunny Mountain Sky and Duke Reagan and included in her pedigree are dogs out of "Bigstone" and "Waldorf" Kennels. Tess has a special place in our hearts because we watched her birth and she has lived with us from her first day. Whenever she greets someone, she always offers her paw for a gentle handshake. Tess is very muscular like her sire, Duke Reagan, and her speed when retrieving is lightning fast. She is owner-oriented and is very attentive to commands. Tess is our "lap dog" and will curl up on your lap whenever she gets the chance. She also loves healthy treats and her favorite snacks are carrots, apples and Romaine lettuce. Tess is featured on our "Pups Grown Up" page and you can see more pictures of her there. Tess' hips are certified free of hip dysplasia and are rated "GOOD" by the Orthopedic Foundation For Animals (OFA). River joined our family in the summer of 2007. 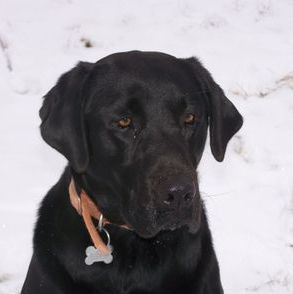 River is a beautiful example of the classic Labrador with a lean, muscular body and a strong, square head. He is 11 years old, weighs about 85 pounds and has a black coat. River has all three Labrador colors in his family line: yellow, chocolate and black. He is a gentle dog who loves a good belly rub. Of course, he lives to retrieve and bounces like he has springs in his feet when he takes off to fetch the ball. River also has a good nose and is tireless in tracking down a scent. 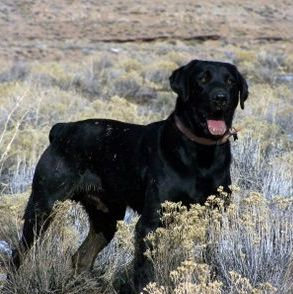 River comes from Champion Bloodlines and the following dogs are included in his pedigree: Master Hunter Mahogany's Runnin' Rascal, Amateur Field Trial Champion and Field Trial Champion Riparian Roughrider and the famous Barracuda Blue who earned the titles of Master Hunter, Amateur Field Trial Champion, Field Trial Champion, Canadian Amateur Field Champion and Canadian Field Champion. River's hips are certified free of hip dysplasia and are rated "GOOD" by the Orthopedic Foundation For Animals (OFA). Walter is a beautiful, chocolate Lab who is owned by friends of ours, the Reed Family. Walter is 9 years old and weighs about 75 pounds. He has a wide, block head, expressive eyes and a thick, otter tail. Walter loves to retrieve and swim, but most of all he enjoys being by his owner's side.